The Mediterranean Basin is the largest example of the Mediterranean biome, which is also found in parts of California, Chili, the Cape Region in South Africa, and southwest Australia. Although rich in history, the Mediterranean Basin is relatively small, covering only 1.5% of global land area, but it hosts almost 25 thousand plant species, about 15% of all known plant species on earth, of which over 50% are endemic. Little wonder then that this fascinating biodiversity hotspot attracts the attention of scientists and policy-makers alike, and its conservation is a top priority. Throughout this course, students will examine the extent, the origins, and the drivers of today’s Mediterranean biodiversity and review some of the most recent studies about its current situation. Students will thoroughly study how the eco-geographical and environmental conditions of the region contribute to the geopolitical realities of today. Students will also identify the most prominent threats to the future of Mediterranean biodiversity including human-derived consequences of warfare, urbanization, deforestation, desertification, and intensive agriculture in addition to the projected consequences of the slow onset of global climate change. This course involves in-class lectures, field trips, and meetings with political actors from local and international organizations. The course is tailored to general science students, which assumes a minimum knowledge of fundamental concepts in ecology, environmental science, earth science, biology, or any other equivalent natural science. 2020 calendar coming soon! View the 2019 itinerary here. Please note, the schedule is tentative and subject to change. Dr. Mohammad Hassouna is a cross-disciplinary environmental scientist, who joined IAU in January 2014. Currently, he teaches Mediterranean Ecology, Principles of Wine Science, and Global Environmental Politics. He previously worked as a researcher and lecturer at the University of Aix-Marseille (France) and at the University of Lausanne (Switzerland) and served as a senior consultant for the Geneva-based international NGO Zoï Environment Network. 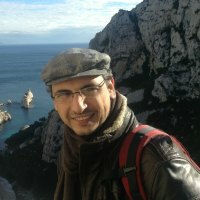 Dr. Hassouna holds a Ph.D. in Environmental Chemistry from the University of Aix-Marseille, a B.Sc. in biology from the University of Birzeit (Palestine), and a M.Sc. in Populations’ Biology and Ecosystems Management from the University of Le Havre (France). He is fluent in English and French and a native Arabic speaker. All program fees include tuition for 3 credits, lodging, insurance, entrance fees to all museums and guest lecture venues, Intra-European transportation to and from each city, breakfast daily and some dinners.